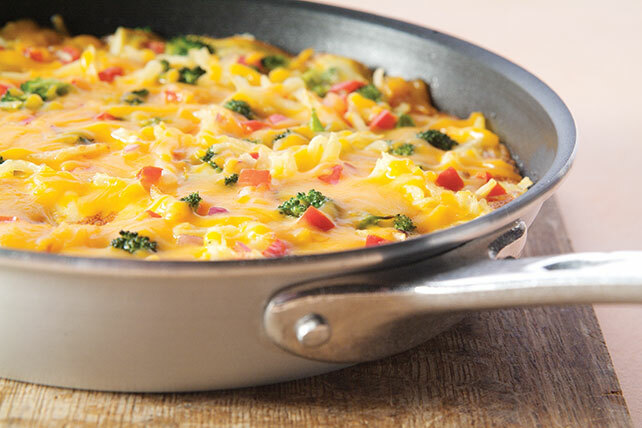 No need to crank up the oven to make this cheesy, veggie-licious frittata. It's made in one skillet and serves six happy campers. Wrap handle of 10-inch nonstick skillet with foil. Heat oil in skillet on medium heat. Add chopped vegetables and hash browns; cook 5 min., stirring occasionally. Whisk eggs, water and mustard until blended; pour over vegetable mixture. Cook 10 min. or until center is almost set; top with cheese. Heat broiler. Broil frittata, 6 inches from heat, 5 min. or until cheese is melted.